Miami Cuban food – Que rica! We were in Miami and Nana wanted some good Cuban food and whole fried red snapper. Being from Belize, this is the closest thing she can get to the food that she grew up eating. My aunts and cousins said the place to go was Laguna. This restaurant is not exactly in the good part of town. In fact, the area looks depressed. It is surrounded by abandoned buildings and empty lots. Even the building that the restaurant is in needs a new coat of paint. The parking lot behind the building is part gravel, part dirt, and part pot hole. However, I did not come here to look at the aesthetics of the building. I came here to eat. It was July 5th and the giant movie screen TV was playing a World Cup match. I remember the date because we were planning to go July 4thbut there was a question whether they were open. I said probably not, but my uncle said they should be open every day. When my cousin called, no one answered the phone. We were not sure if they were busy or closed for the holiday. We decided if all of us were going to make the trek from various parts of South Florida, we needed to be 100% sure they would be open. And yes they were closed on July 4th. The small restaurant of about 10-15 tables was packed (probably because of the game). Because our group was so large, we ended up sitting at a table that was right in front of the TV. The TV was so big though, we did not block the screen. The servers were courteous but did not talk much at first. When I ordered in Spanish, they seemed to perk up and be a little friendlier. Since it was so busy, none of them were making any extended chit-chat. Everyone did stop to look at the TV when there was a particularly tense moment that would decide which team would advance to the next level. Nana and I ordered the medium fried fish. It comes with steamed rice, ripe plantains, and black beans. This is a carb dieter’s nightmare. Thankfully, I am not counting carbs (although I probably should). I do not like beans, so I ate my rice plain. I am glad that I got the medium fish instead of large as I originally planned. As hungry as I thought I was, I would not have been able to eat it. I ate half my fish, all my plantains, and half my rice. The flavor of the breading on the fish was amazingly delicious. The fish was fried to perfection. It was tender and flaky with a delicate crunchy skin. I have had fried fish in a lot of places, and this was one of the top. I do not eat the head (I guess I am too Americanized), but Nana raved about it. 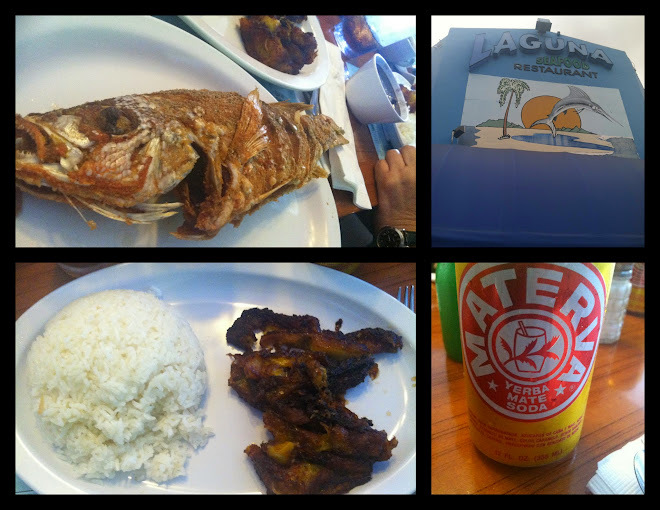 Overall, the food was very good and I definitely recommend their Cuban food (fried fish in particular).